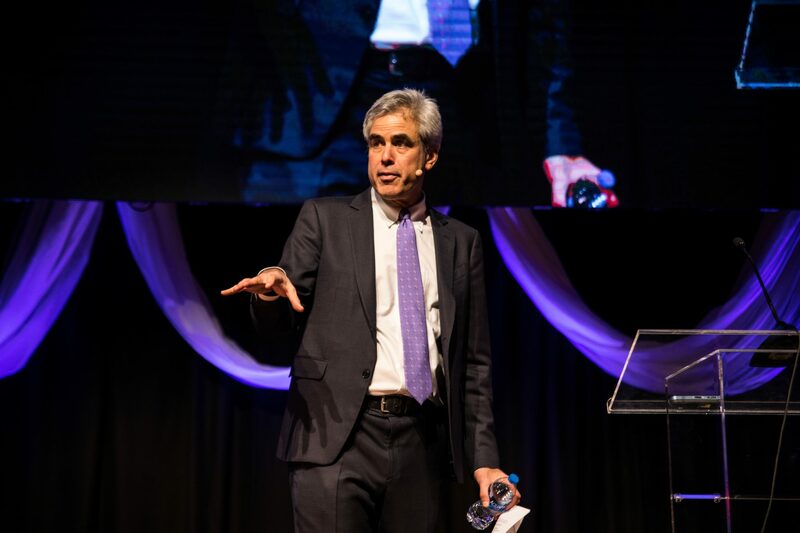 Last month, Jonathan Haidt—professor of social psychology at New York University’s Stern School of Business, ethnically Jewish, politically left-leaning, and religiously atheist—stood on the main stage of the Council for Christian Colleges and Universities (CCCU) conference. “I was born to be the sort of person who is opposed to your mission,” he told about 1,200 college leaders. Several things changed his mind, Haidt said. Not to convert to Christianity—he’s still an atheist—but to drop his hostility toward it. “I got my first teaching position at the University of Virginia,” he told the CCCU. UVA draws students from all over the country, but especially from the western and southern parts of the state. As one who studies morality, Haidt was also impressed with the Bible (“among the richest repositories of psychological wisdom ever assembled”) and with the actions of Christians (“religious conservative Americans are . . . more generous with their time and money [than secular Americans]”). “I started realizing that the scientific community at that time . . . was really underestimating and misunderstanding religion,” he said. Haidt’s charming introduction softened the room, but his academic work got him the invitation. 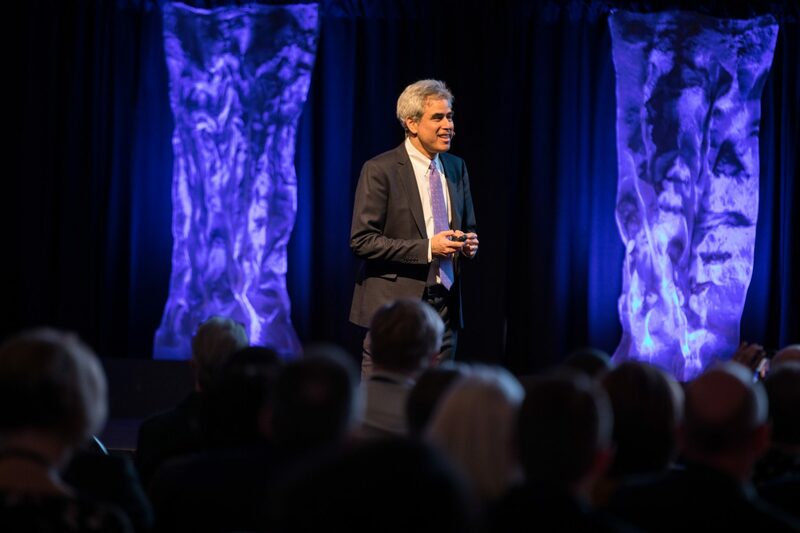 Haidt has been earning accolades in the public square for some time—he was named one of the top 100 global thinkers by Foreign Policy in 2012 and one of the top 30 world thinkers by the British Prospect Magazine in 2013. He’s been studying and writing about morality and religion since graduate school, penning The Happiness Hypothesis: Finding Modern Truth in Ancient Wisdom in 2006 and The Righteous Mind: Why Good People Are Divided by Politics and Religion in 2012. It was The Righteous Mind—“the most important book in years,” Ethics and Religious Liberty Commission president Russell Moore once tweeted —that caught the CCCU’s attention. Haidt’s book is laced with evolutionary explanations, but it’s not hard to see the design in what he has discovered. For these reasons, Haidt explains, politically liberal and conservative people can talk right past each other, each amazed and appalled at the “immorality” of the other. And it’s true that Christians have been a bit slower to warm up to Haidt’s ideas. Since then partisan differences in America have only widened, according to a recent Pew Research Center survey. And President Donald Trump, it seems, is more of an effect than a cause. The growing gap on a variety of values—government regulation of business, welfare, corporate profits, race issues, immigration, homosexuality, environmental regulations, and military strength—was happening long before 2016. That change is making politics a lot less friendly. 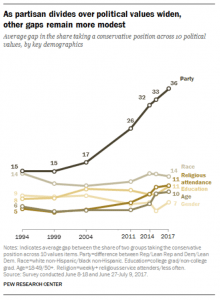 Almost half of both Democrats (44 percent) and Republicans (45 percent) view the other party “very unfavorably,” a “dramatic” increase since the 1990s, Pew stated. The 2016 election turned the media spotlight onto that gap, and also onto white evangelicals, who are struggling with their own partisan conflict. While most white evangelicals have been Trump’s staunch allies, many leaders have been outspokenly opposed. “It’s been a challenge in the last decade to see divisions within the church as well as within the broader political conservative world, not to mention disagreements we have with each other across the political aisle or theological spectrum,” Hansen said. To have Haidt’s window into that division is a gift, he said. 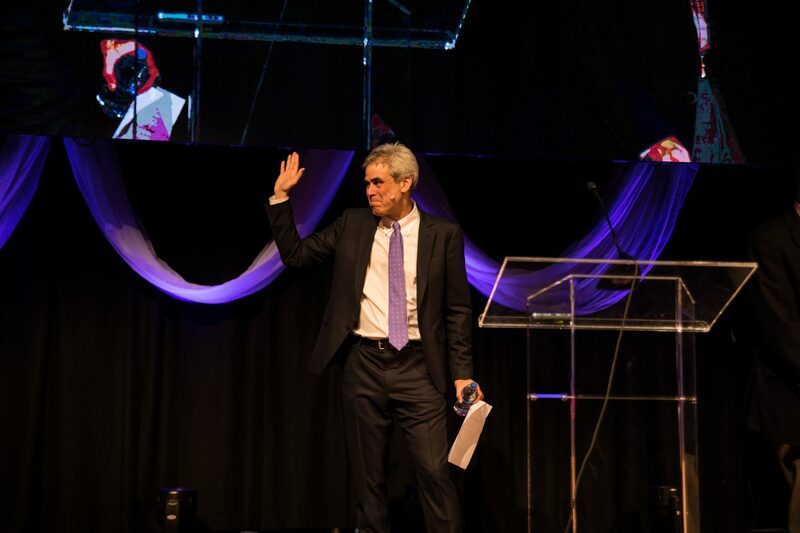 Meeting evangelical students wasn’t the only experience that changed Haidt’s views on religion. As a 29-year-old liberal atheist, he struggled with this culture, but only for a few weeks. Haidt began to open to their interpretation of reality—where men weren’t oppressors of helpless female victims but all were part of an interdependent family, where “honoring elders, gods, and guests, protecting subordinates, and fulfilling one’s role-based duties were more important” than personal autonomy and equality. In this, Haidt is his own example of the “rider and elephant” analogy, which he introduces in The Happiness Hypothesis. If our emotions are like an elephant, reason is a rider perched on top. Most of our decisions are gut reactions, our intuition as strong and unwieldy as an elephant. Our reasoning comes later to justify our decisions, and only through hard work can the rider get the elephant to switch directions. Haidt isn’t the first to argue that emotions usually trump reasoning. But people try it all the time, both in the religious and political spheres. That’s because giving emotions their due has fallen out of favor, a casualty of the Enlightenment and the growing estimation of scientific logic and reasoning. Too far out of favor, Haidt would say. He and others have “shifted the framework,” said Wheaton College political science professor Kristin Garrett. She changed her dissertation topic to morality and politics in part because of The Righteous Mind, and teaches Haidt’s work to her students at Wheaton. Garrett does this by posting Bible verses around her home and office, being mindful of the music she listens to, and praying—in short, by ordering her affections. But as we’re making our gut moral judgments on issues, so is everyone else. It’s a remarkable, even Augustinian statement for an academic atheist. 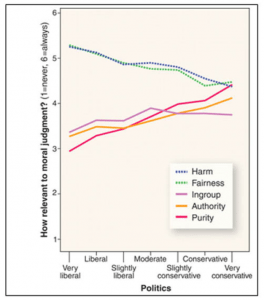 Using multiple surveys, Haidt found that political liberals don’t give much credence to the last three. Even in the first two, which conservatives and liberals both hold highly, the interpretations cause fractures. While both parties prize care, they disagree on crime (Should we focus on rehabilitating criminals or on protecting victims?) and abortion (Do we prioritize the mother or the child?). And while both prize fairness, liberals tend to value a fair division of resources, while conservatives value a fair opportunity to earn those resources. No wonder it feels like the right and left are talking past each other. The #MeToo movement is a clear indication that our culture is not becoming less moral, but prioritizing differently, he said. “Haidt helps us to recognize that we can’t be content to touch on one or two moral realms we find compelling. We must press deeper into empathetic understanding of others to realize there are other realms of reality we often underplayed or ignored or even acted against. “For Christians, that means driving relentlessly into the Scriptures to encounter the full moral spectrum of the perfect God-man, Jesus Christ,” he said. Hansen’s 2015 book, Blind Spots: Becoming a Courageous, Compassionate, and Commissioned Church, was inspired in part by Haidt. But listening to one another and being kind, while helpful, doesn’t completely solve the difficulty between liberals and conservatives. Because each side is fighting not just for its values, but also for its tribe. “Hiving [living in community] comes naturally, easily, and joyfully to us,” Haidt wrote in The Righteous Mind. But drawing lines to create inclusion also creates exclusion—being close friends with some people means you aren’t close with others, joining one church means you aren’t a member elsewhere, living in one country means you aren’t a citizen of another. This message caught the attention of Biola University president Barry Corey. Over the last few years, he and other CCCU leaders have been advocating to the California legislature that faith-based colleges should not be forced to change their standards on sexual identity, such as housing based on biological gender and standards on marriage as between man and a woman. “As we’re going through a lot of the dynamics in California, I realized that I needed to spend more time with influencers outside of our circles who could help us understand what we were doing and how we could do things better,” Corey said. The two visited each other’s work places multiple times, eventually coauthoring a piece in The Washington Post on their unlikely friendship. CCCU president Shirley Hoogstra is also looking to Haidt to be a bridge. When she asked Haidt if he’d consider speaking at the conference, he was eager to accommodate. “He asked me, ‘How can I help your people?’” she said. So she asked him to teach Christian college leaders how to be better communicators with those outside of the faith, just like Corey is trying to do.